A leading UK food store with over 240 branches nationwide. Treble's partner, Andrew Moore, formerly employed as an art director for Waitrose has designed and art directed in-store publications, brochures, press packs and point of sale to appeal to different corners of Waitrose customer demographic. Each project has it's own unique visual style created using art direction of photography and illustration, typography and printing techniques. 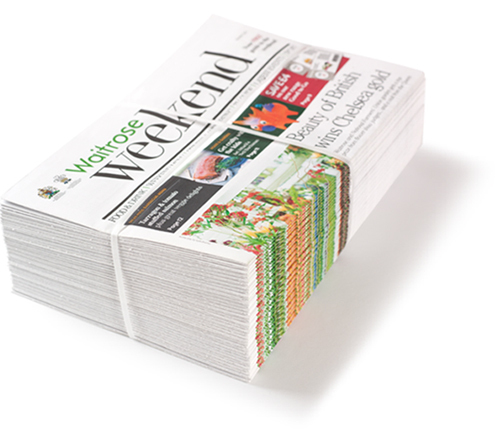 In conjunction with Waitrose, Treble designed a monthly publication, New magazine and created the visual identity for the launch of Waitrose Weekend, a weekly customer newspaper. Treble redesigned Weekend after 33 successful issues when it expanded from 16 to 32 pages.